Much of the problem boils down to good old GIGO and to what Vionlabs sees as an overly simplistic way of analysing content data and customer sentiment. The most basic method of content recommendation is metadata-based recommendation, which is the one most prone to the foibles of human error. This relies on comparisons made between the metadata that has been tagged to each film. Some metadata might have been carefully and thoughtfully constructed. It may have even been built with machine learning, cataloguing faces and elements in the film itself. Or it may have been typed in by a low-paid data jockey, who has 1000 films to catalogue and a few lines of ad copy as a guide. Or maybe there’s no metadata at all. The metadata content recommendation approach might note that you’ve enjoyed a film that features a car chase, and will then conclude you want more films with car chases. You now have a string of recommendations which include Terminator 2, The Fast and The Furious, 2 Fast 2 Furious and Smokey and the Bandit. If the content on the platform has been blessed with a deep and complex set of metadata, the results in this kind of recommendation can be perfectly adequate. Other times, the connections need some detective work before they become clear (“Ah, the reason I was recommended Steel Magnolias is because my favourite movie, The Deer Hunter, has steel workers in it). A second approach is collaborative filtering-based recommendation. This is the one where the preferences of multiple users are compared, and results in recommendations of content that other people who have profiles similar to you have liked. In theory, the accuracy of collaborative filtering recommendations gets more refined the more data the system is exposed to. Your recommendations may include something like: “Other people who liked Alien, also liked Blade Runner.” Or “Other people who liked Alien also liked Schindler’s List, or “Other people who liked Alien also liked La La Land”. Some of these may seem out of the blue, some absurdly obvious, but occasionally there is the opportunity to be exposed to something you might not have thought of, but might really like. Vionlabs suggests a more advanced way of recommending content – emotion-based recommendations. The company has developed a methodology for evaluating content based on the emotional impact the content has on the audience. The method also takes into account the colour palette and the level of movement in each scene, and Vionlabs has produced a fascinating set of motion graphics which give a visual fingerprint of each film. This results in clusters of recommendations becoming more accurate, and also depends on fewer datapoints to produce. 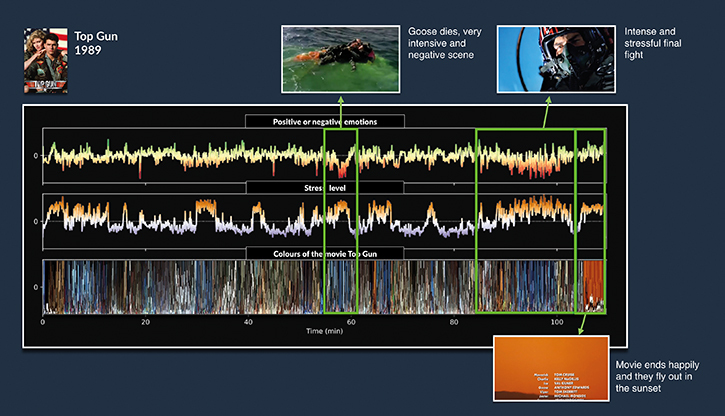 The company has been been working to efficiently analyse the entire dramatic flow of a film, graphing parameters like positive vs. negative emotions, audience stress level and colour (see the analysis of Top Gun above). At present, there is no method for Vionlabs to fine tune the customer journey in real time, so the company has divided up the viewing timeline into four segments – morning, afternoon, evening and night – allowing for different sets of recommendations for each part of the day. But there’s no reason the technology won’t catch up. The potential for AI in recommendations could very easily extend to being able to offer content based on the viewer’s current emotional state, which could readily be inferred from data gathered from social media, movement and activity, and purchase data in near real time. “There’s a clear study of anxiety attacks, how they are more likely to occur in the evening,” says Pendari. “So those types of people may not be able to watch dark movies or content later in the day. Recommendations could be made based on what’s best for mental health.